This three bedroom townhouse has amazing sea views from Peyia down to the sea and includes access to the communal pool (shared by 6 Townhouses) which is located directly in front of the property. It is located 8 minutes drive from Coral Bay up the hill and in a quiet location. The center of Peyia is a 2 minute drive away where you will have access to various local tavernas, bars and supermarkets. The house comes fully furnished with Internet WiFi, Netflix, DVD player and sleeps six. Each bedroom has an en-suite bathroom. One bedroom is located downstairs and 2 bedrooms are upstairs with the master bedroom having access to a large private balcony with sea and mountain views. If travel cots or extra bedding are required, this can be provided if suitable notice given prior to arrival. Bed linen and towels are provided for your stay. If you require fresh towels and bed linen on a weekly basis, this can be provided at an extra charge during your stay. Please note that a washing machine is included in the property. Comfortable and very nice house located on the hills of Pegeia, with 3 bedrooms each one with its one bath, very clean, with everything you need in the kitchen, high-speed internet, Netflix, great pool with night-lights. 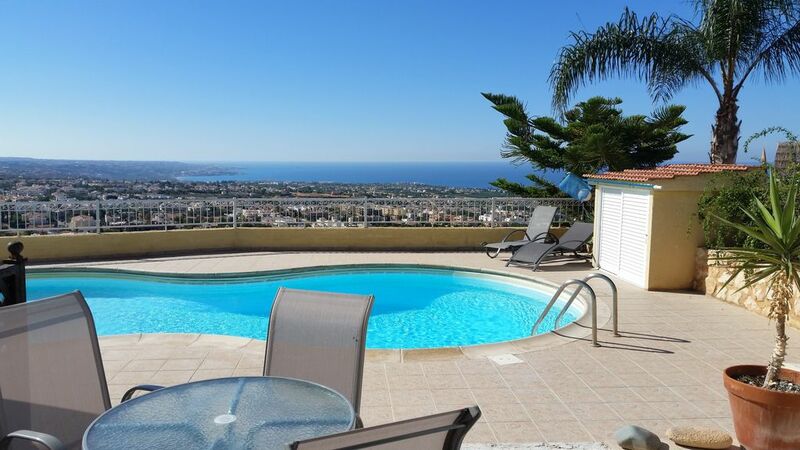 Absolutely amazing view from the house and pool - the sea, Coral Bay, Pegeia, Chlorakas, Paphos. It was fantastic! Supermarket and tavernas are not very far in Pegeia, but I would recommend to have a car and not walk in the sun. The owner was fabulous, she prepared a welcome-basket that we highly appreciated and she was very helpful! Thank you very much!